Here is some of the history of the Church of the Brethren in Central/Southern Illinois. The City of Champaign (ca 1895) was originally considered a part of the 'Blue Ridge" church territory. The Champaign First Church of the Brethren had it's beginning about 1901, when Charles A. Lewis, a minister, and his family moved from Farmer City, Illinois, to Champaign and began to look for members of the Church of the Brethren. After some time he and Brother William Roney found a place for public worship on the second floor of a store building on West Main St. in Urbana. (The exact address is no longer known. Any knowledge on the subject will be welcomed.) There they were assisted by John Barnhart of Mansfield. About fifteen persons were in attendance at their first meeting. Later they arranged to meet in a schoolhouse on the east side of Urbana, where they met regularly for some time and G. O. Stutzman assisted in a two week's series of revival type meetings. In 1912 a new meeting site was sought in northern Champaign. 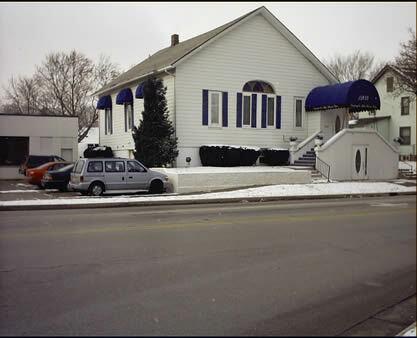 Property was obtained a 1201-1205 N. Market and a tent erected at what was to become the first Brethren building at Champaign at 1203 N. Market. The building at 1203 N. Market (now a funeral home) was built in 1913 and services were held there until the current church at 1210 N. Neil was begun in 1950 and completed in 1953. The parsonage (8 rooms) was added at 1205 N. Market in 1918 and is still there.